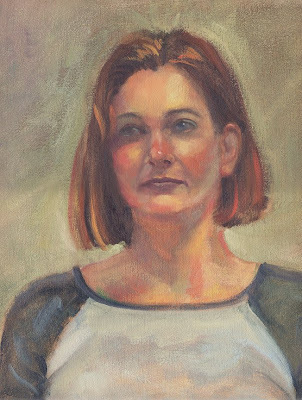 While cleaning out my studio, I came across this portrait I did in a John Solie workshop session at an American Society of Portrait Artists weekend seminar, held at the Academy of Art in August of 1999. Color-wise it is less awful than most of the other life paintings I did in those days--though I have utterly no memory of what Mr. Solie said that might have facilitated that. Hi, Stephanie. So nice to hear from you. Having a clean(er) studio always feels great, doesn't it? Everyone always told me to save my work, but some of it just seems like an unfortunate visual record of things best forgotten. I'm so sorry Don wasn't able to make it back there this summer. I miss him coming to Sacramento, too. I guess nothing lasts forever--though I hope to catch up with him again somewhere. Meantime, I guess I'll do my best to remember and apply everything he's said.